Hey friends heyyy!! I’m Luna! Your fabulous, sassy and fun friend who is not afraid to speak her mind. Oh yeah, I’ll let you know that your ugly sweater is actually ugly ugly and not funny ugly. Also, don’t settle for turning in at 9 pm on New Years Eve when you really want to make it to midnight! You deserve an awesome start to the new year and that’s where I come in. Pop some champagne and give me a fancy dog cookie with the sprinkles on it and we will have ourselves a par-tay! 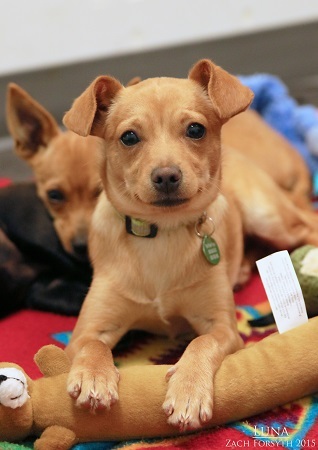 As a 5 month old Chihuahua I am a bit of a wild child, but I’ll keep you on your toes and living life to it’s fullest! I do well with other animals and need a home that will do puppy training to channel my energy in a positive way! Am I the bestie you are looking for? Fill out the adoption application to we can schedule a meet and greet. I am fixed, vaccinated and microchipped. My adoption fee is $250.